Affordable Accoutrements: A Cactus on the Table??? And a Giveaway! An online dictionary offers "trappings" as a synonym for accoutrements and gives the following examples: cathedral ceilings, heated swimming pools, and other accoutrements signaling great wealth. Items I've shared through posts to Affordable Accoutrements definitely don't relate to "great wealth," but I hope readers have found them interesting and helpful in some way. Estate sales have been the primary source for tabletop items I've featured ... along with thrift stores and online auctions. Today I've set a table for four in the breakfast nook. This particular setting will definitely rank among the most affordable I've shared with you to date. We'll start with the centerpiece. The holiday cactus in the solarium is in bloom. In case you're interested in Latin names of plants, holiday cacti, commonly knows as the Thanksgiving Cactus, Christmas Cactus, and Easter Cactus, comprise several closely related species in the genus Schlumbergera and the species Hatiora gaertneri. I always find it fascinating when any type of cactus blooms. It seems somehow incongruous that something so colorful, delicate, and beautiful can burst forth from a plant that's normally harsh, spiny, and tough looking. And the cactus was free, a gift from a friend! She was about to throw it away ... I'm glad she didn't! I folded a wet paper towel and placed it in the bottom of a silverplated Revere bowl (to minimize chances of the bowl being scratched by the clay pot) and camouflaged the pot by filling the space between the bowl and pot with greenery from the garden. The roses from last week's tablescape still appeared to have some life in them, so I cut the stems short and inserted them into the moist soil to provide additional color and act as a filler flower. The Revere bowl was a recent Goodwill purchase. At $1.99, I didn't hesitate. It was tarnished, but the plating appeared smooth and intact (no rough or green spots to indicate plate loss). It polished up beautifully with my favorite silver polish, Wright's Silver Cream. 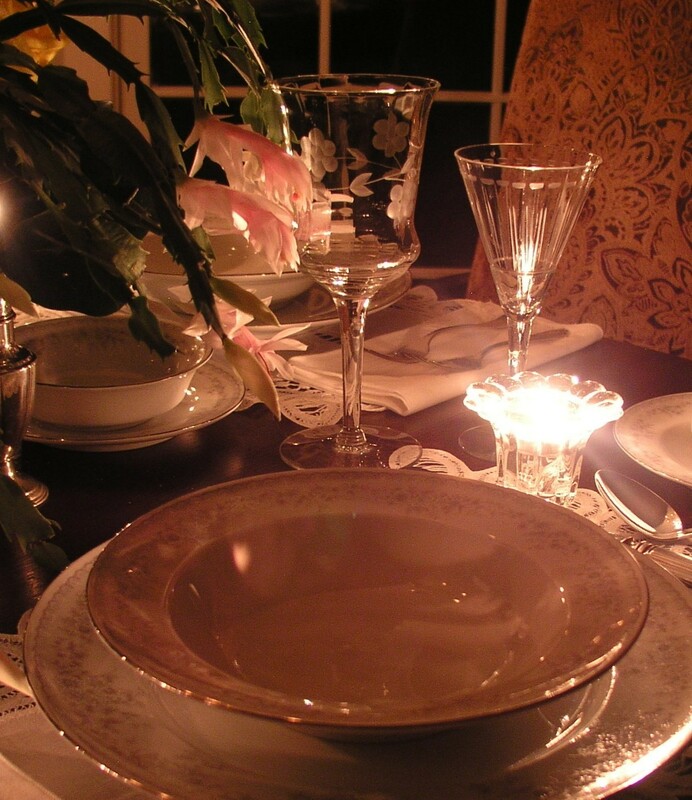 In setting the table, I used mostly silverplated items, along with a few sterling silver pieces. The candlesticks are plated. They were on sale at a local antique mall, reduced from $24.50 to $4.50 for the pair. They're a nice heavy weight and in perfect condition. The creamer, open sugar, tongs, and salt & pepper shakers are sterling, estate sale bargains (the vintage creamer and open sugar totaled only $15). When I poured milk (not cream) into the cream pitcher, it formed a few bubbles. I thought it might be fun to capture them in a photograph. I think there's something very appealing about using old-fashioned sugar cubes. It seems to make sweetening coffee or tea feel more special than when one simply pours in a spoonful or two of the basic granulated kind. Do you agree? The tall stemmed water glasses are from Goodwill and cost 99 cents each. The etched wine stems are from a local estate sale. It was the second day of the sale, when small items were half price. A set of six totaled $4.00. Another view of the glasses. This segment of the holiday cactus resembles (to my eye at least) a holly leaf and serves as a reminder of Christmas and the spirit of giving. I added mismatched chairs to the usual pair that flank the antique table. Here's a closer view of the flowers. 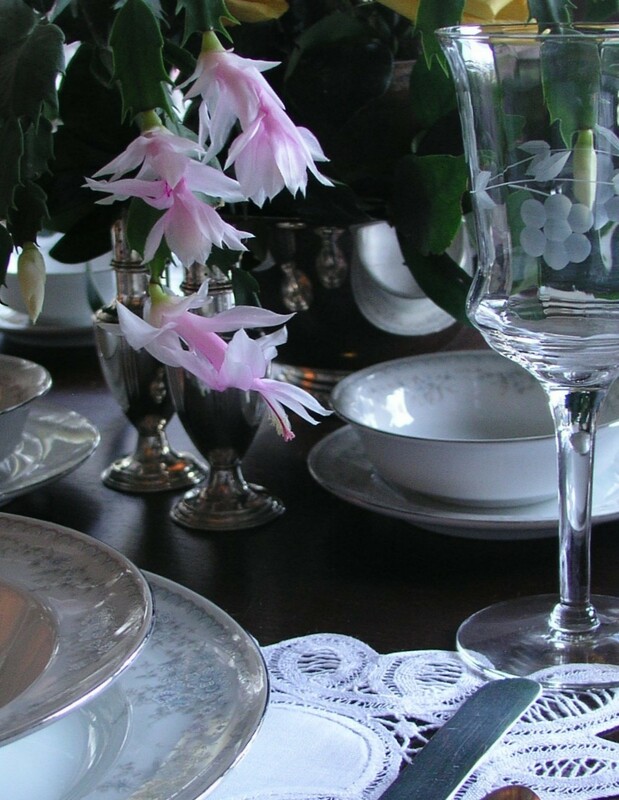 The placemats and napkins are a linen/cotton blend accented with Battenburg lace. I purchased a boxful of them at a garage sale for $1. The vintage plated silverware came from a variety of sources, including a bagful of flatware purchased at very little cost from Goodwill. Read about it HERE. I used four different patterns, alternating simple designs with more ornate ones. I always dig through boxes of flatware at antique malls and thrift stores. It's amazing what you can find! 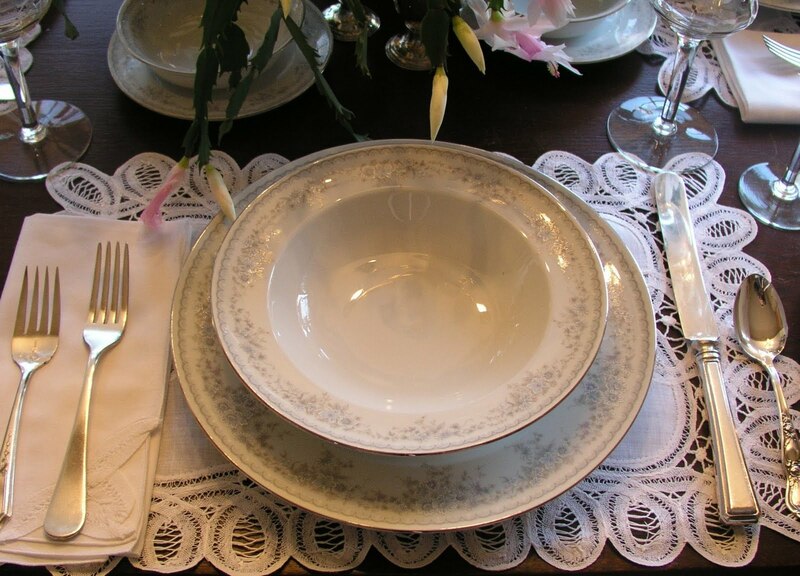 The china is "Royal Lace" by Johann Haviland, four six-piece place settings. I like the fact that each place setting includes a soup/salad bowl and a berry bowl. Typical place settings of china include a salad plate, and bowls usually sell separately. A closer view of the subtle floral pattern. The set is in like-new condition and ... the price is ... FREE to a lucky reader of Affordable Accoutrements. If you leave a comment, your name will be entered into a drawing to be held on December 15, 2009. If you let me know you're a follower, your name will be entered twice. If you mention that you subscribe via e-mail, I'll put your name in a third time. Due to the weight and size of the package, I'll have to ask that only readers who reside in the continental US be considered eligible for this particular giveaway. Other drawings (for lighter weight items!) will follow. 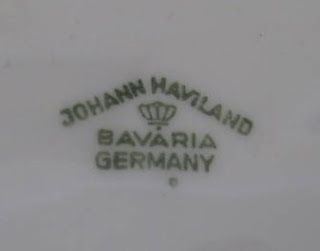 Jean Haviland (later changed to John/Johann) was the grandson of David Haviland of New York, the founder of Haviland & Company, in Limoges, France. Jean started his own company in Germany in 1907. World War I took a toll on the company; it was sold, and later sold again to Rosenthal. 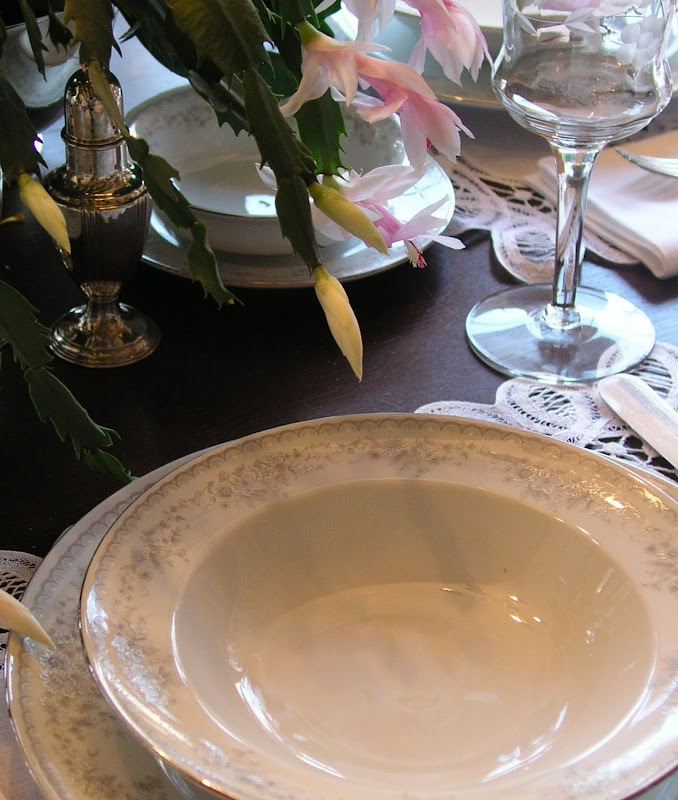 "Following the Second World War, Rosenthal began to heavily market Johann Haviland china in the United States. Many of the patterns produced during the second half of the century were sold or given away as premiums with groceries. 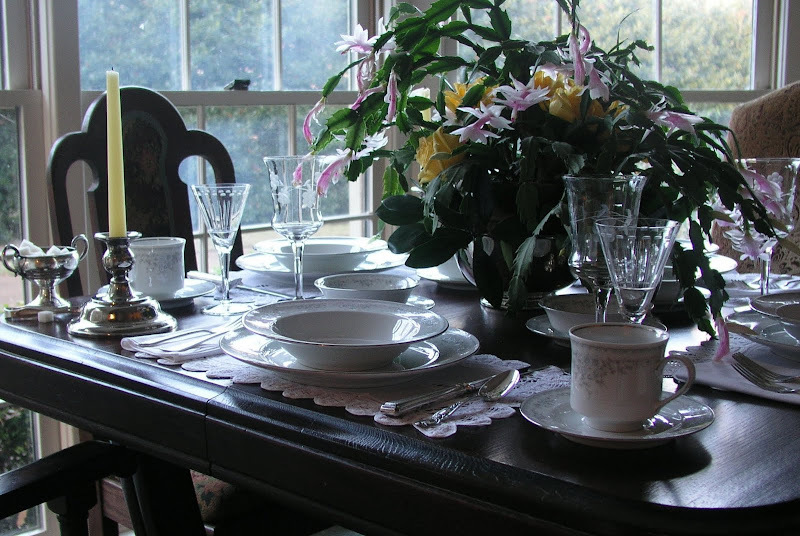 Many families acquired their Haviland China pattern by acquiring one piece at a time, when the family’s grocery shopping was done. 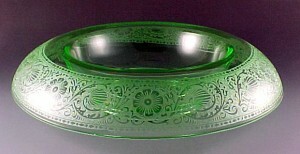 The people of the United States favored Johann Haviland’s designs because they resembled the elegant Limoges designs for which the Haviland name became popular. To meet the demand for these designs, the Haviland Waldershof factory remained open through the late 1980’s. " 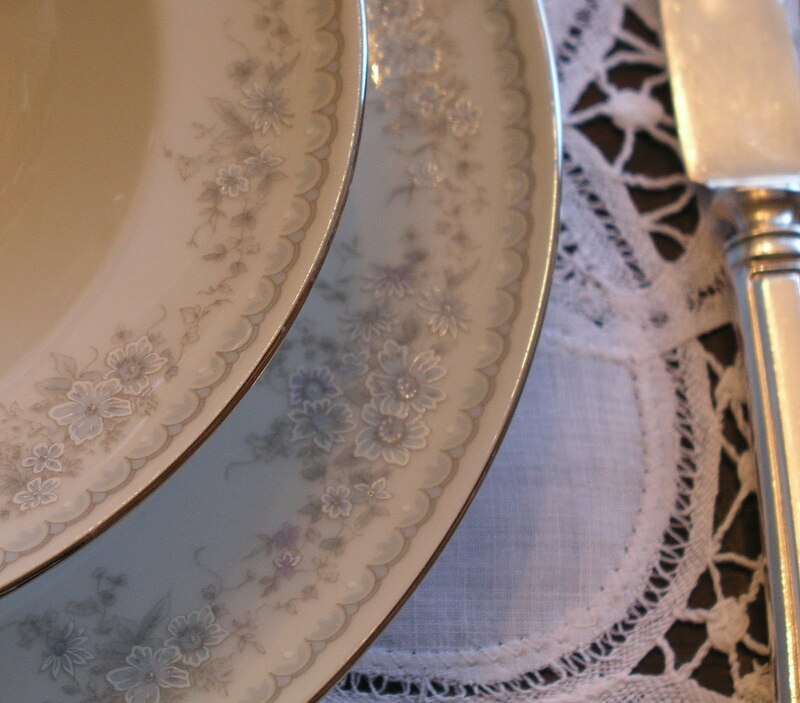 Replacements, LTD offers "Royal Lace" for approximately $65 per place setting. Now you KNOW I didn't pay quite that much! I certainly hope the lucky recipient of the china will find it useful and attractive. 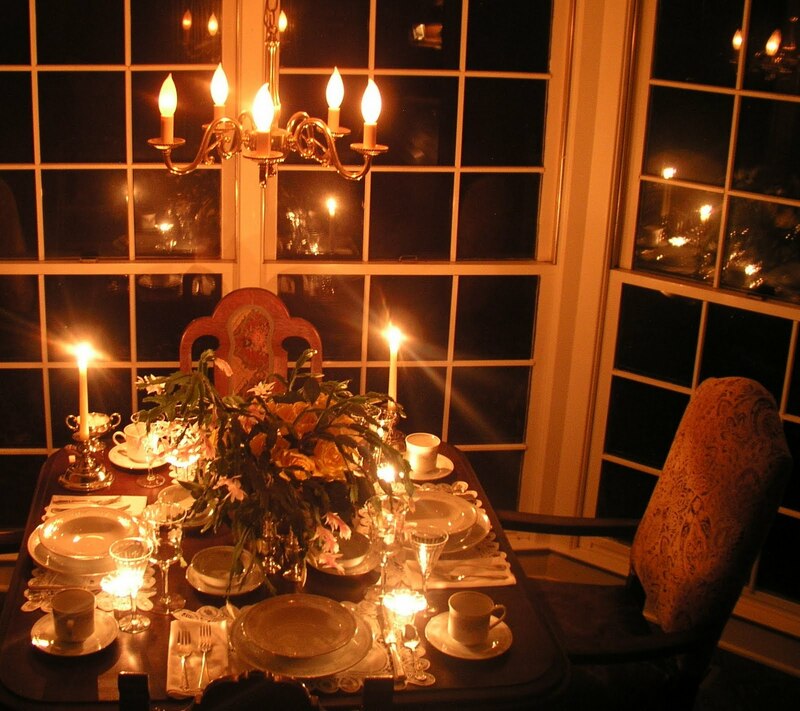 I thought you'd want to see the table, and the china of course, by candlelight. I wonder who will win the giveaway ... I hope it's YOU! Thank you for your visits, your kindness, and your support. 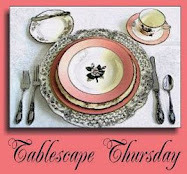 Don't forget to visit Susan of Between Naps on the Porch for Tablescape Thursdays! It's always a fantastic party, with the most gracious hostess imaginable! I have enjoyed your interesting tablescapes! I just started following your blog a few weeks ago. The photography is great! The cactus is beautiful. You obviously have an superior nose for excellent bargains! Nice table and as I am clairvoyant my guess is that you were wearing a dark shirt (grey/navy?) and light coloured (off white) chinos when taking the photos? Only joking! Spotted your reflection in the splendid, shiny candlestick! That cactus is outstanding and I agree it does resemble holly. And I agree about the sugar cubes too, and they just pretty up the table! This is just all so uniquely beautiful. I feel the same way while paging through a magazine and come across a beautiful picture, that I just want to be there. Or as my two-year-old granddaughter says "I want to go to there!" Bill, this is definitely a "I want to go to there" tablescape! Beautiful as always, Bill! I loved seeing the Christmas cactus too. Well drat! You know I am in Canada. Oh well, sniff, sniffle. My father in law had a greenhouse full of Christmas cactus. They would bring them in from the cool greenhouse in time to bloom for the holidays. They would put one big one in the center of a huge, round glass coffee table and it would fill the entire table, covered in thousands of blooms. Stunning. You be careful up on the counter top Bill. Maybe you should invest in a light weight step ladder before you break your neck. 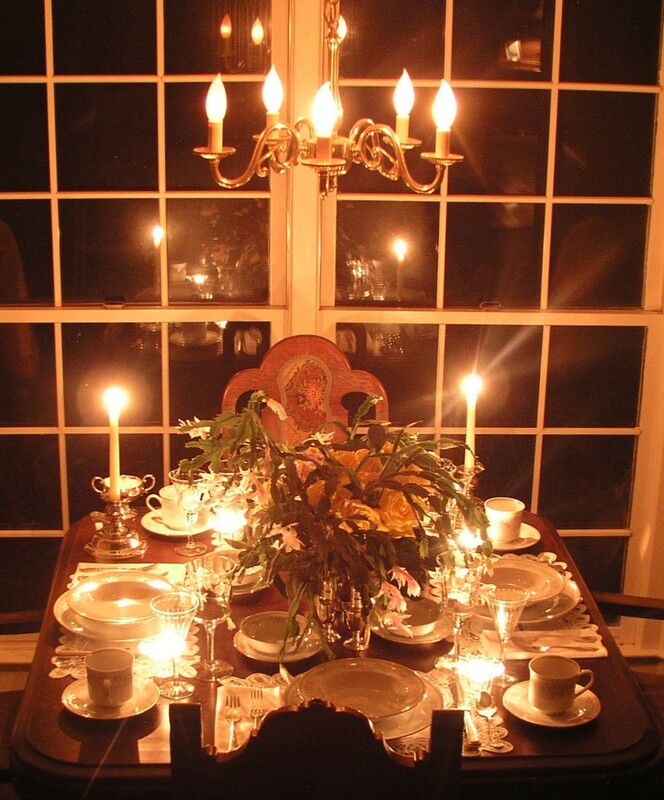 Yes please:) I am a follower of your lovely tablescapes since I found you on BON. They are always so lovely. Oh my gosh, this setting is just stunning, and the fact that you used a Christmas cactus. Now I love that. I may be using it for my table at Christmas. It is just so lovely. I love the way you set it into the Revere bowl and then camouflaged it with greenery. You clever thing you. OMG I so love it. The stemware is just exquisite. So sparkly in the candlelight. I love that picture you photographed. I also just adore those candlesticks. I would feel so grand to be able to sit at this table and dine. You would make all guests feel like a prince or princess. Such a wonderful host you are. I would so love to win this china. I am posting a message. I have been a follower since the beginning, and I subscribe to your email. Always your tables are splendid! You have an eye and talent for elegant arranging. Thank you for sharing, and until next time I wish you good health and happiness. 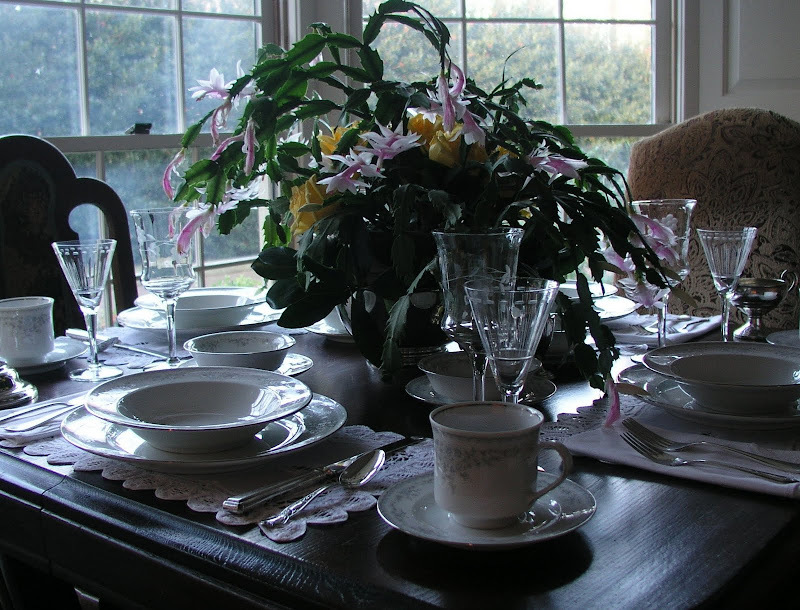 Your tablescapes are always beautiful with your Estate Sale finds! It's nice that former treasures are treasures once again! Love the Christmas (or Thanksgiving?) cactus -- I have a wee one which is in bloom. And I need to put it on my breakfast room table. Alas, everything is still fall at Linderhof -- but the mail has been gone through and the laundry is half done! Christmas tomorrow! I found your blog several weeks ago via Susan at BNOTP and I must say, your tablescapes are beautiful AND enchanting! I love your use of photography. My late grandmother instilled in me a LOVE of anything related to dishes, china, crystal and tablescapes in the very early 60's when I was still in grade school and it is still a love I hold dear. Thank you for sharing such beauty with us, I appreciate it so much. In fact, I spend a very long time with several cups of coffee going over and admiring every little detail. I look forward to many more tablescapes, too. I subscribe via e-mail and I am a "follower" of your blog, also. You have found some wonderful bargains. This new obsession I have with table settings makes me want to get my sterling flatware and other pieces back from my mom. I told her many years ago that she should just use them...I didn't really want them. Who knew? Your cactus is so much larger than most...it looks gorgeous. This is a very impressive giveaway...how fun it would be to win this one! I am a follower and love to see what you post. Beautiful breakfast table! Bill, when are you going to write a book on tablescapes...as one of your followers, I would be first in line to purchase it! I ♥ that you give a history lesson with each posting. I have learned so much from you. Thanks for sharing not only your fabulous pictures but your wealth of knowledge. I was just wondering about sugar cubes - I've been thinking about them as a way of portion control with no mess and wondered if sugar cubes were even still made. Now I know they are and I will add them to my shopping list. beautiful tables you shared! thanks for the inspiration. OOOHHHH my, you've done it again with a gorgeous tablescape and orchestrated a lovely atmosphere for a relaxed mood. Lovely pictures for sure. I am a follower of yours and am leaving a comment. Hallelujah, that's two chances to win! God bless and Merry Christmas to you as December is just a few hours away. Well Bill, you have done it again, the table is just beautiful. 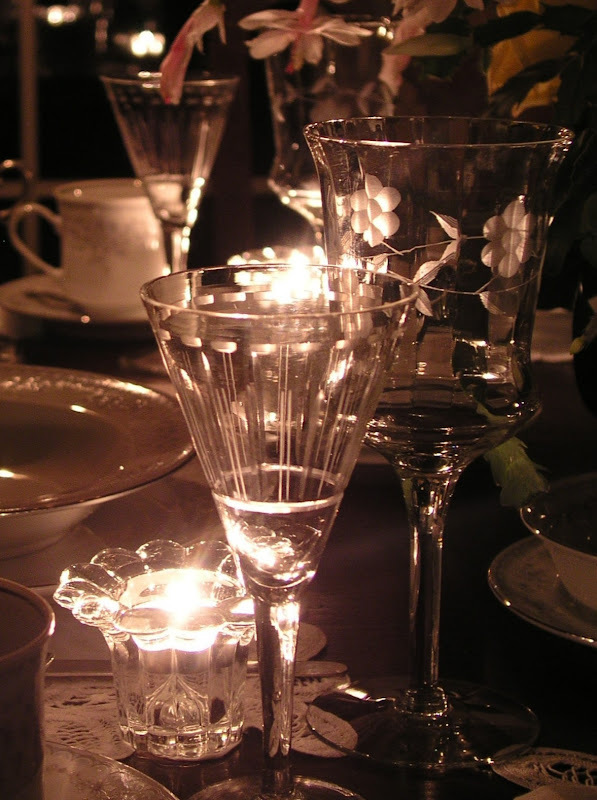 I loved all the stemware, my fav, was the table in candlelight. But I have to tell you, you do have me beat in one area. You see I have this little ladder that I carry around with me to take my pictures, but I have never stood on my island, food for thought, I'm filing it. Yes I stalk, I mean follow your blog, subscribe and now leaving a comment. Thank you so much for all the inspiration you give to everyone each week. Bill, you've done another beautiful and elegant table. I think Christmas cactus blooms are so delicate. Just lovely! I'm in awe of you photos each week. You find the most interesting angles and items to spotlight. You certainly have an eye for beauty, both in the real world and through a camera lens. How lucky we are that you share your talents with us. What a beautiful table! I am going to look for a Christmas cactus tomorrow! Thanks for the great giveaway... I am a follower and enjoy your blog very much. Bill please sign me up for your giveaway I would love to bring this home with me for the holidays what fun it would be to display it, it is beautiful. I follow, please sign me up. Oh, beautiful, Bill!!! It is all so lovely, and i do love a pretty Christmas cactus! You are so inspiring with your table settings! Well, who can pass up a chance like that? Surely not your followers such as myself! Fab as always! Just love the elegant way the cactus blooms fall out of the Revere bowl. As always, you have set a beautiful table. I love the china and would love to be entered into your giveaway. I am a loyal follower! I have three Christmas Cactus plants I inherited from my Grandmother and I just love how you used yours as the centerpiece for your tablescape. I love your crystal...you have some of the most beautiful pieces! The cactus is soooo pretty! Awesome that it's blooming for the season...very tricky to get them to do that sometimes. What a generous Give-a-Way...you are a sweetie playing Santa this time of year. Bill, Thank you for another beautiful tablescape. I love learning about all the history behind your patterns. 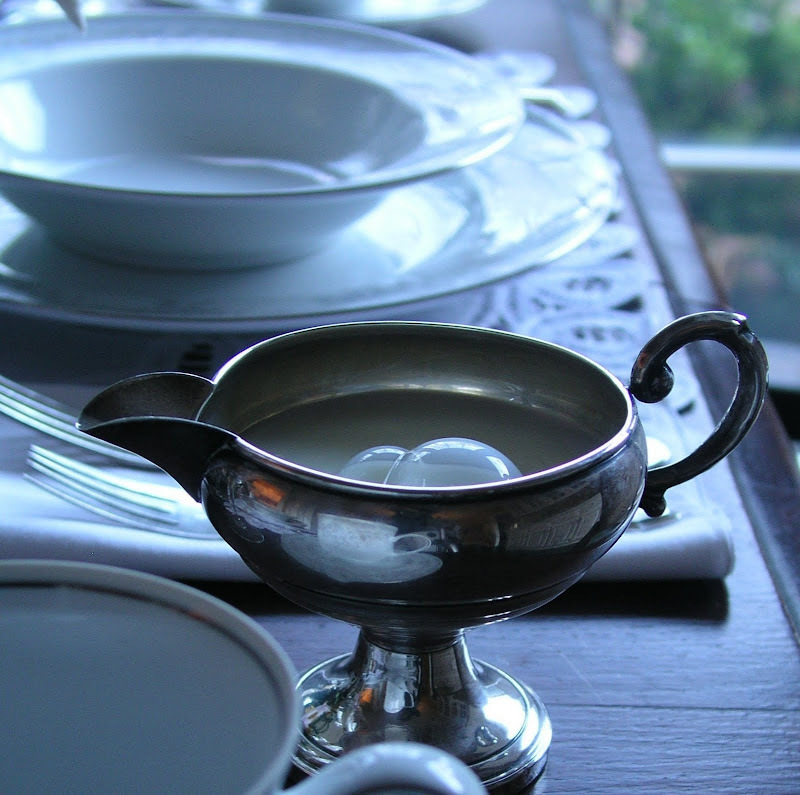 This is so delicate looking and I especially love the silver creamer and open sugar. I love sugar cubes! Thank you for the chance to win and I am sure the lucky winner will be grateful too! I am looking forward to your Christmas Table! What more can I say! Lovely, lovely table! Beautiful. My mother always said that her Christmas cactus bloomed when all the Christmas bills were paid...sometimes almost Easter! My CC has stated blooming, but it's not but 3 years old. Each year it gets more & more. I check it each morning to see if new buds have appeared. Bill, I love that you've used placemats instead of a tablecloth which would cover all that lovely wood - and I love the white against the dark. I've been using this tactic myself, not wanted to cover up Gramma's dining table. I've mixed my china patterns, but the mismatched flatware is inspired! What a great way to use all the beautiful pieces you have. Another wonderful post. Thank you. As always, Bill, your table is simply elegant. You definitely have an eye for beauty...from the "throw away" cactus to the silver plated candlesticks. Unlike you, I would have passed by many of your items, never imagining how lovely they would be once given tender, loving care. I have truly enjoyed following your blog, and have done so since your very first post. I am also connected to your email postings...gotta have my inspiration! Who knows... a little of your style may rub off on me yet! Oh, what a lovely table setting, and how generous of you to be giving away the china! It's beautiful, and I'd love a chance to win it. I am a follower of your blog, as well. Beautiful, beautiful, beautiful!!! Please count me in for the drawing, and I am a follower, too. Thank you for a give away of such wonderful "trappings". Very generous! Artie, you are a great inspiration to me. I love the table. What a perfect size. I could use one like that. 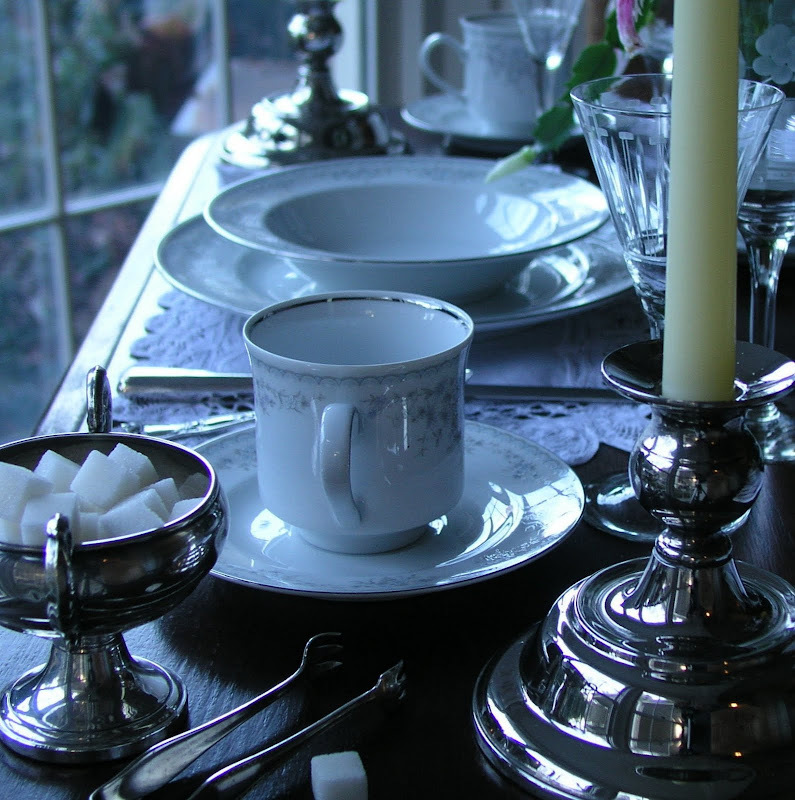 Also, I am a silver snob ( yes, I admit it) and I love the idea of mismatched flatware. I was not brave enough to do that. But after seeing your breathtaking table I am going to mix also. The holiday cactus fills the center of the table and drips onto the edges of the placesettings- I love it, as a matter of fact, I love all of it. Grand style. I’m definitely a thrifty fan! I scope out the most exclusive shops, so I can recognize quality when I run across it at bargain prices. I laughed reading how you perched precariously with your tripod. I’m constantly moving things around, and pushing furniture out of the way to get a shot. The bubbles were a wonderful photo, and yes I agree sugar cubes add a bit of elegance. This is a generous giveaway, and if I was lucky enough to win, they would look divine at my table. I’ve been a follower and enjoyed your blog since its early days. 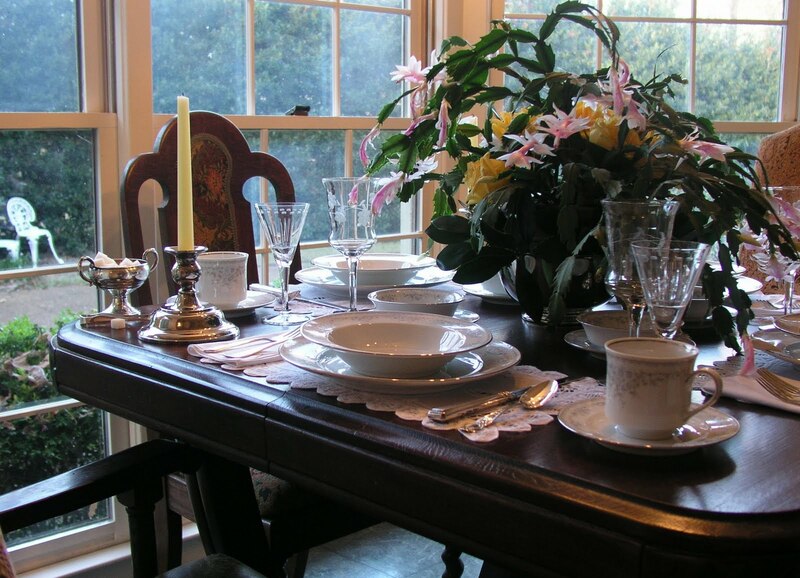 Lovely to see your tablescape ~ beautiful as always. The pink Christmas cactus is lovely and my Mother used to have a red Christmas cactus. Your heavy based candlestick is lovely. Looks the perfect romantic table by candlelight. I have been a follower for a couple of months! I am always so surprised at what you pick up at the Goodwill (our local Goodwill never has anything as beautiful as the treasures you find)!! Gosh, I want to come shopping with you. The table is beautiful! I use sugar cubes because I like them on the table...you can also find brown raw sugar ones at the gourmet stores. You give away if most generous!! Another incredibly gorgeous table, Bill! I have a question. I posted my dining room, on Met Monday, with the Christmas tree, etc. I set the table as part of the metamorphosis. I used stemmed glasses for candles. I bought them at a garage sale,last summer. I'm wondering if you've seen any like them or know anything about them. They are glass, not crystal and what seems to be a Star of David design is on the base. I thought they were interesting and had no idea how I would use them, when I bought them. In the end, I found they are just the right size for tealights. Bill, another gorgeous table! I've been following you since your first tablescape and have loved every one. While I have posted a comment every now and then I never realized I could sign up for your emails! Where have I been? I'm going there right now so I don't miss a single thing you say or show here. I just wish I lived closer to you - I'm just outside of Atlanta. It would be pure joy to go bargain hunting with you. Our Goodwill never has anything half as interesting or exciting as the things you find. Bill your tablescapes truly are a dishaholics dream. Stunning totally stunning. Kathy. Fantastic tablescape! The mixed silverware is so interesting at each place setting. I am soooo wanting a Christmas Cactus...I may have to visit the nursery tomorrow. Once again you have set a magical table. I love your blog. I have several of your past tablescapes bookmarked so I can refer back often. Due to one of your older posts I am now the proud owner of aluminium serving pieces! Thanks for reminding us that there are used items just waiting for us to find them. This is very pretty, Bill. I love the stem ware, and the silver. My GW never has any good prices on any of those items, always close to retail, not very many good choices either, how frustrating! 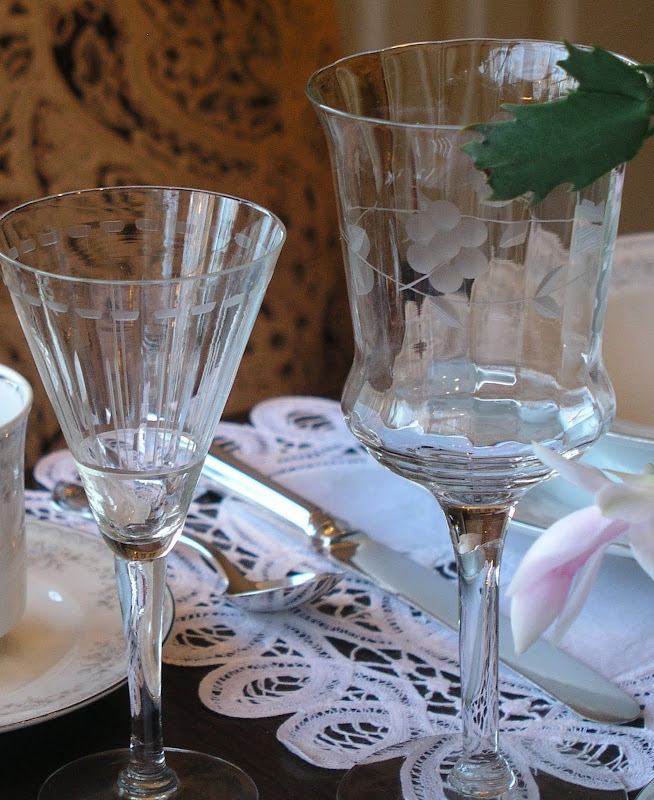 Your table settings are always just right, not too much or too little! 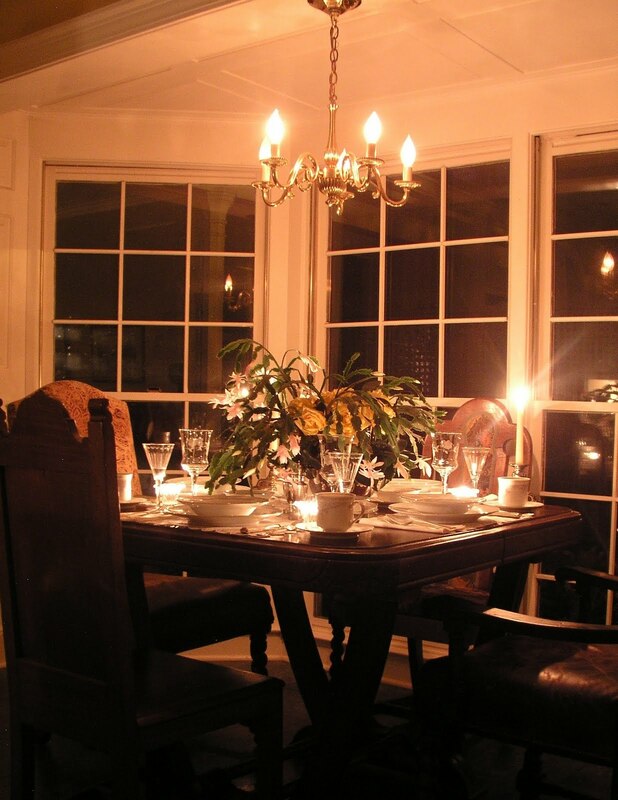 And those windows in the dining room, how wonderful! Love your chairs, too. Hope you'll stop by for a visit sometime soon! Please enter me in the drawing, and yes, I'm a follower. Oh my this is beautiful! Yes I hope the winner is me too! So you know I'm a follower -- throw my name in the hat...or the china bowl....or the crystal glass....or, well you know -- whatever way you are collecting names -- please enter me too! As usual, once those lights go down and the candles come on I Oooo and Ahhhh outloud! Glad no one's home to judge...lol. Gorgeous Bill as usual. Please enter me in your drawing. I'm also a follower and have been for a while. I didn't even know I could subscribe for email...so I just did. I hope I win!!! Enter me twice since I am a follower! I love it when you do the smaller table settings because these are more practical, so I really am enjoying this display. You are a crazy guy and your partner must get some laughs!! The views from on high may be threatening to your health. Oh, I love those heavy candlesticks and the centerpiece. Love the table too!! Lovely tablescape! I am a new reader of your blog and I'm enjoying your talent and creativity. My Christmas cacti have just started blooming--they took a beating this year from a surprise spring hailstorm-but I'd never thought of using them as a centerpiece. Your's look beautiful. Love the stemware, I keep buying older"unnamed" patterns whenever I find them but my husband informs me that we're running out of space! This is a lovely tablescape. I would love to adopt the china, it would be great to have a set that didn't have pink roses on it. I'm not a pink person but seem to collect pink! Thanks for sharing another lovely table. I am now officially a follower and getting email updates. Don't know why i didn't do it earlier. Oh, my! How beautiful!! Love it all! The night time shots are stunning! When I first saw the word "cactus" I was thinking a tall Arizona cactus, and I thought, Huh??! LOL! That white/pink Christmas cactus is gorgeous! My deep pink Christmas cactus (I call it a Thanksgiving cactus!) is also blooming! Wow! What a great give-away! I'm a follower, and I need to look into the subscribe by mail thingy. Thank you for another delightful tablescape, you always have the best and they always take my breath away. I didn't know about the connection between Haviland & Rosenthal. 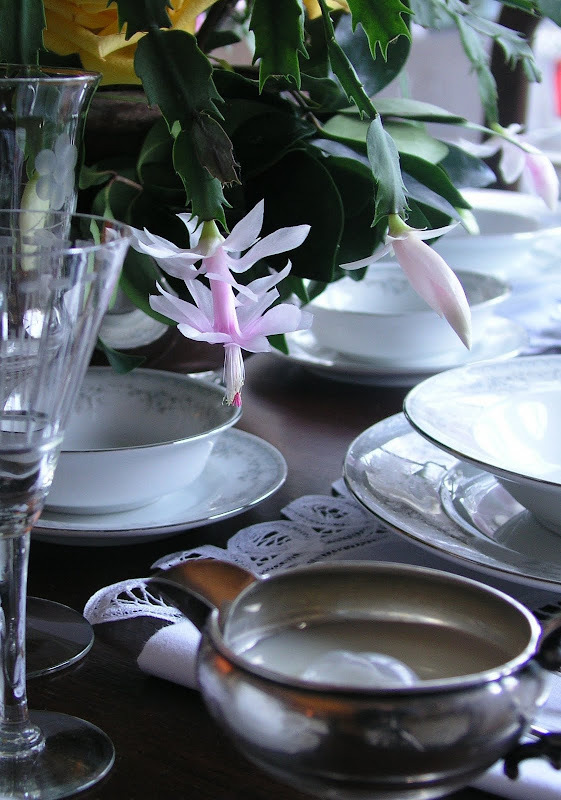 I purchased a beautiful dinner service, for 12, whilst living in Bavaria and plan on creating a festive tablescape with it soon. Oh my gosh....what a sensational giveaway....it's so lovely. Your tablescape is just yummy......and you are the Super Bargain Shopper...what fabulous buys.... I love allll of it. 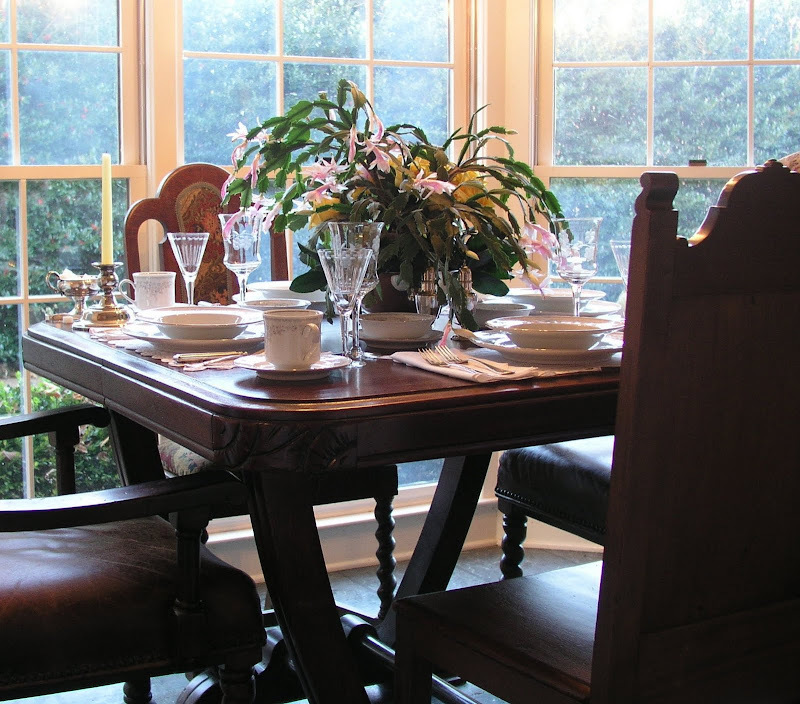 I enjoyed your post a great deal, the table is beautifully set and your finds are clever and nicely coordinated. 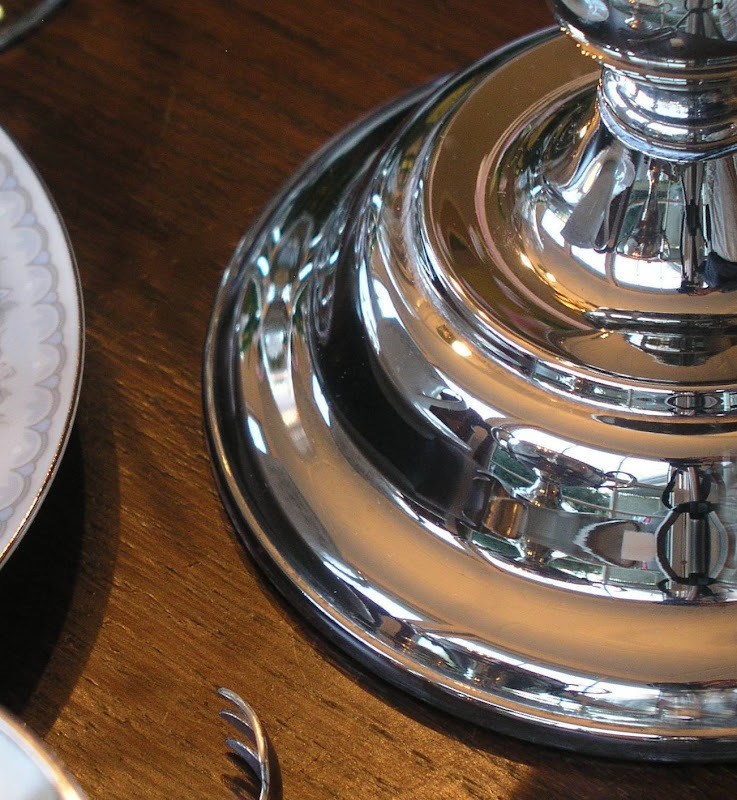 I love silver and keep collecting dishes in just about the same manner as you do. Ultra chic through treasure hunting! 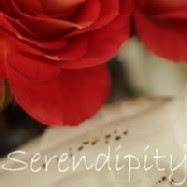 Well, I am now following your blog and hope that you will find one of my 5 blogs interesting enough to follow as well. Bill, I will be there for breakfast tomorrow, seriously it is a very beautiful setting for a warm and friendly breakfast. I love Christmas catus and for the first time in a long time,I don't have one, lost it this past year. There are no words for the giveaway, except wow! I am out of the drawing because of my current overseas location but got to stop to say how much fun it is to visit your blog space and see what you have created each week with your affordable accotrements. Beautiful table and you captured super photos ! WOW..!!! Once again you have a jaw dropping tablescape. Each week a new and beautiful table. I love what you do, you're right up there with Eddie Ross. I would like to be entered in the giveaway, I'm a faithful follower, and a subscriber. P. S. I have a Christmas cactus with so many blooms I can't count them, mine is a deeper pink. Absolutely beautiful! I love the Christmas cactus...just have not been able to keep one alive. I'd love to be a winner! I'm a follower and a subscriber via email. Beautiful table, Bill..My cactus always used to bloom around Tgiving too! What a wonderful give away..Mr. Claus! Mine looks mighty small in comparison..
Bill, I have a Haviland set very close to that one, from my mom's house, so no need to enter me. You know I come to look and enjoy, no more reward needed. And dh says I have way too many dishes! But I think whoever wins will be truly delighted! I used Villeroy and Boch this week...def not affordable! We have a little outlet here in Southampton that I haunt waiting for sales. I went with The Tablescaper a few times this summer! What fun! Your table, as usual, looks beautiful! Thank you for entering me in the dishes giveaway. I adore your blog! Hello Bill!! What a beautiful table!!! You have such a talent for setting the perfect table! Hope I win the china to go along with it!! Beautiful Photography ! Our family loves sugar cubes at the holidays. We have a silver reindeer that has a sleigh and this is the special spot for the sugar cubes. This was passed down from my MIL. We treasure family traditions . What a talent you have ! As always your photos are the best ones. Happy weekend. I love the china AND your site. I am a follower and subscriber and am so happy to have found you in this vast sea of the Web World! You are so skilled and talented at this! Beauty on a budget and you pulled it off amazingly! Thank you also for doing a giveaway! Super exciting. Another AMAZING table! You certainly have inspired me to find as many estate sales as I can. About a month ago I was lucky enough to find 5 Limoges demi-tasse cups (white with gold edges)for $20! Mint condition. I felt like I hit the lottery! 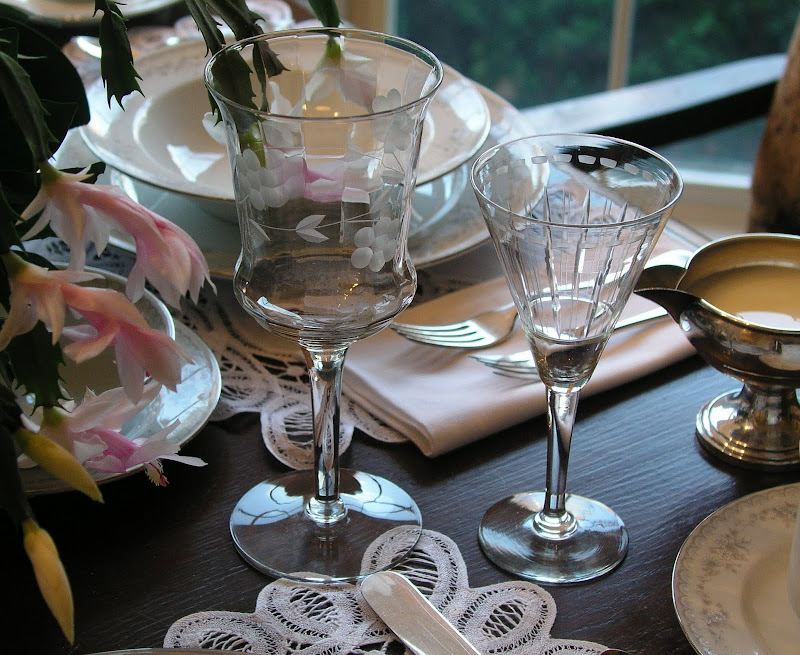 I am now looking for those glasses that you featured on a past tablescape. The ones with the silver foliage. I found ONE at a local "Savers" store. Please enter me in your giveaway! I am a "Follower" and I am on your email listing. Thanks so much! Keeping my fingers crossed! gorgeous table setting, I'm so jealous! lol. I guess the cactus part intrigued me, and here I am visiting your blog... I have a southwest theme in my home so I was inspired by the cactus touch and yet the elegant table... I wouldn't have thought a cactus would have made an effective centerpiece before your photos. Your setting is amazing. I wish I could have been there! You have such an eye for this. It was such a pleasure to see all this. Thank you! I love seeing table settings. Viewing from above via the kitchen island is just super. Does it count if I subscribe in an RSS feed to follow? I don't think that I mentioned before that I am a follower (from TN). My Christmas Cactus now has 10 buds that I hope will be in full bloom by Christmas morning when I host the family brunch. Just beautiful! I LOVE the bubbles! Love it all, Bill! Hi, Bill... as usual, you have done an exquisite job of not only setting the table but photographing it to perfection. I always enjoy reading your posts and have been a follower since the beginning. I think your giveaway is extremely generous, but that doesn't surprise me because from the minute I first met you, you were the soul of generous cordiality. You always make my day brighter, and it's apparent from the comments, you do the same for many, many more bloggers. While I would love to win this gorgeous giveaway, my cupboards are packed to capacity and are, in fact, overflowing. Hence, I literally have no room to store another set of china. I made a promise to myself that I can't bring another thing into this house until I get rid of some things, and I am at a loss to know where to start. That being said, I would still like to take my two chances to win, and I'll tell you why. Were I blesssed to win, I want to give the china to Barbara, the Purple Goat Lady, who also follows your blog. She lost her favorite goat recently and some of the little babies, too, and I think this would be a nice thing to do for her. So if that's permissable, that's what I'd like to do. P.S. I love the sugar tongs and enjoy using cubed sugar, too, though I have what has to be the most exquisite sugar spoon I've ever seen which forces me to alternate. As the other Shelia would say, "Can you be in love with a sugar spoon? Why, you bet your sweet granules, you can!" ;-) I also loved seeing the bubbles in your milk, the color of that Christmas cactus, and the gleam from your silver. Lovely all! Bill, it is all so lovely! The china, silver, the crystal! I love the cactus, I have one just a little brighter pink blooming now. I do love them. I also took a good look at your table. I have one similar. I been thinking of painting it,for as of now I do not have another room for it. Oh, but you may have changed my mind. lol The leg on mine are turned and do sort of like a gate leg table, but it not. Hope all as well and your Dad is doing good, Oh, I love the bubble in the milk! You have the most incredible table settings I have EVER seen! The aerial shots are fabulous. They should be in a magazine. I really enjoy how you have a cape or fur on the "throne" seat. You're so creative. I've never seen a pale pink Christmas Cactus before, only the brilliant red. The pink is so sweet and delicate looking. Have the merriest of Christmases!! 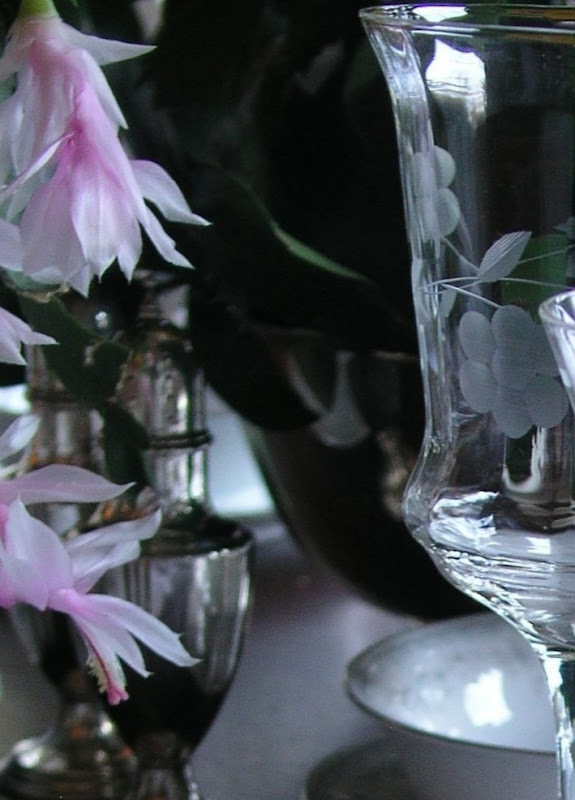 I love this smaller table setting, Its just beautiful.I love the Christmas Cactus, Its just so lovely. The plate pattern is very pretty.I also loved the way you captured the bubble in the creamer.That was kool.Outstanding as usual.